Princeton University’s Graduate Student Council (GSG) have released an official statement calling on University authorities to step up the provision of housing for post-graduate students. The statement, which was approved May 14, argues that every graduate student affiliated with the University should have the right to choose to live close to campus. Issues with graduate housing have become acute, with the planned closure of the Butler Apartments off South Harrison Street. Butler has provided a large number of reasonably-priced rental units for graduate students for decades, but the University plans to raze the apartments and has no immediate plans to redevelop the site. The plan to demolish Butler has drawn criticism from at least one University professor, but the University has responded that new graduate housing, including that being constructed at ‘Lakeside‘ (see photo above) will offset the units lost. 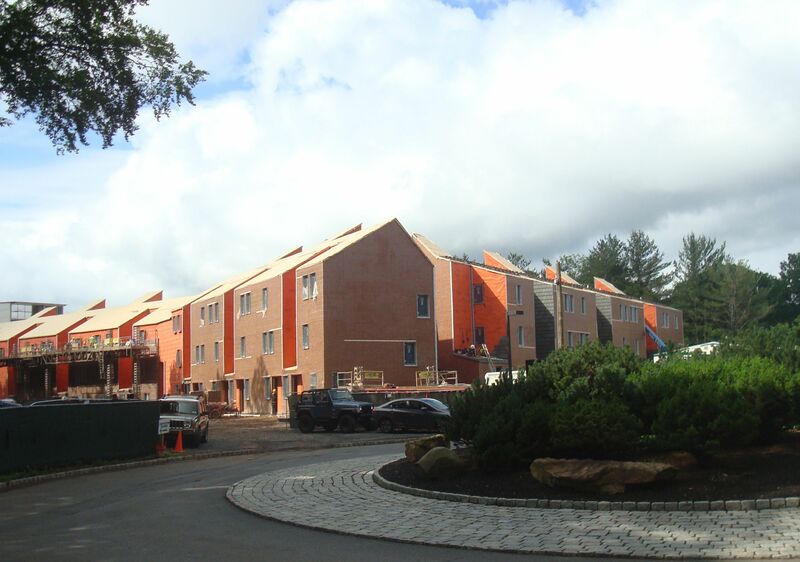 As municipal Princeton has not zoned nearly enough multi-family housing, and regularly placed strict limits on the size of rental developments, it is not surprising that graduate students cannot easily find a place to live in Princeton. In 2014, tens of thousands of Princeton employees live outside town, many priced out of an exorbitant real estate market. The Graduate Students have the possibility to lobby for more housing, and state excellent reasons why the University should offer them accommodation, not least to build a cohesive academic community. In their statement, the GSG proposes temporary measures, including keeping Butler open, and bulk-renting apartments in private residential complexes. As Butler is out-dated, a long-term solution requires construction of much more accommodation. The new Merwick-Stanworth development will help, but* Fundamentally the University, like the town more generally, has a shortage of homes for its people. It makes little sense for graduate students to be excluded from the town- that runs counter to Princeton’s college town atmosphere, and undermines local businesses who depend in part on the student population for their continued success. The continued complaints from the graduate student body convinces us that the problem is real, and we can only hope that the town and University will work together to find an appropriate solution, and that local residents will not stand in the way of construction of new rental housing. * Updated 6.27.14 – it has been pointed out to us that the Merwick-Stanworth redevelopment is for faculty housing, not graduate student housing. Do you agree that there is an issue with finding rental accommodation in Princeton for graduate students? Or should they just go live somewhere else? Let us know in the comments section below. This entry was posted in Affordability, Community, Downtown Vibrancy, planning, Princeton, Real estate, Smart Growth, Zoning and tagged grad school, Princeton, Princeton University, rentals, student politics. Bookmark the permalink. Actually, Princeton’s website indicates that they do have plans for the redevelopment of the Butler site. It will become faculty housing like Stanworth. Although faculty certainly need housing too, it’s discouraging to see both lots of land go toward faculty housing when only 75% of graduate students can be housed with the current sites. The housing plan calls for the reconstruction of the Butler Site. This reconstruction will replace the existing buildings with approximately 220 new units, allocated for rental and purchase by faculty and staff. Proposed plans for the Butler Site include over 110 stacked flat units, approximately 70 townhomes, and a mix of approximately 40 single family dwellings or undeveloped lots. This does not seem like a solution to the problem – surely it will lead to further increases in the price of rent as it neither decreases the demand nor increases the supply of units. In fact it could be argued it decreases the supply of rental units (at least for non-students), thus pushing prices higher..
As early as 20 years ago, Princeton felt like an elitist enclave of pretentious people with a “let them eat cake” attitude. You folks are doing your best to fight that, but you don’t seem to be winning.